Are you ready to venture into the wilds of the Witchwood to hunt down Hagatha the Witch and her friends? 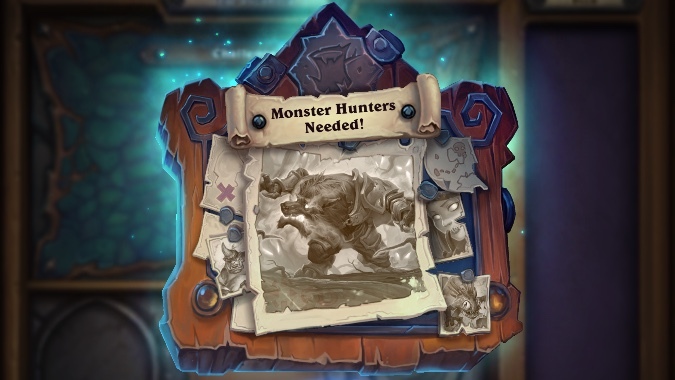 We’ve been eagerly awaiting Hearthstone’s new single-player Monster Hunt mode, and it’s finally here — and we’re pretty dang excited about it. If you haven’t been keeping up with all things Hearthstone, Monster Hunts follow the same model as the Dungeon Runs from Kobolds & Catacombs. You pick a hero and are given a pre-made deck with which you venture out to fight the Witchwood’s terrifying inhabitants. Every time you defeat one, you have a chance to pick a set of cards to add to your deck, including powerful treasure cards. Each fight pits you against a random boss, and the more you fight, the more difficult they become. Losing clears your deck, meaning you have to start over and build a deck from scratch. 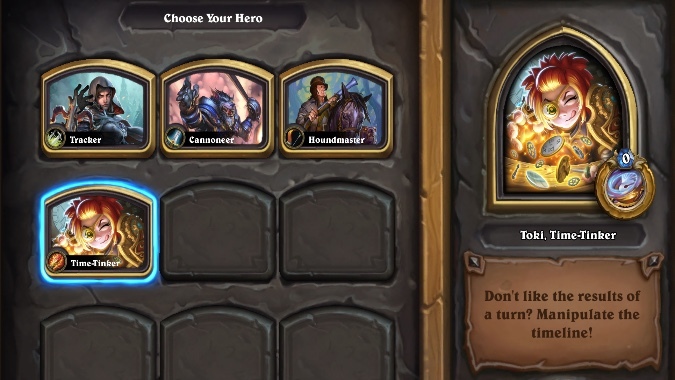 When you manage to beat eight bosses in a row, you’ve won — and if you beat all eight using each of Monster Hunt’s four heroes and you get to fight Hagatha herself. But while Monster Hunts follow the Dungeon Run blueprint, there are some notable variations — and I think they make things a lot more interesting. 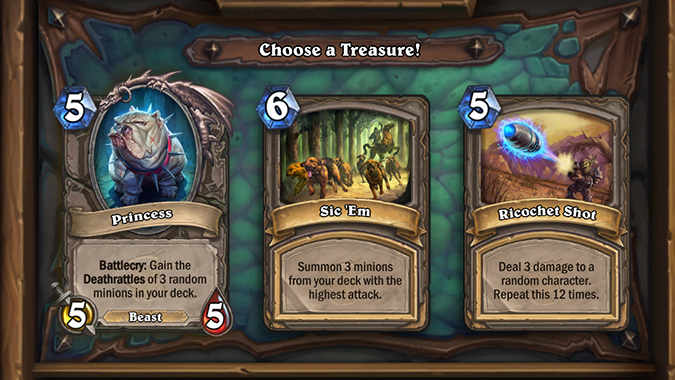 Instead of using the game’s standard heroes, there are four unique heroes to play, each with their own Hero Power as well as a few unique cards and treasures. Even if you’re not invested in single-player Hearthstone, playing will net you some Witchwood packs: right now winning 10 games with each hero will earn a pack. (And if you’re particularly terrible at hunting monsters, be aware that those wins don’t have to be sequential.) When you log on, you should see a quest pop up for each hero in turn. If you aren’t sure where to get started with Monster Hunts, Matticus, Ted, and I have some tips on how to tackle each hero, so read on for more. Hero Power: Scavenge, discovers a class spell that has been played this game. Tess has a nice mix of Hunter and Rogue class cards to start with. The Cult of the Wolf treasure helps greatly since it allows you to use Scavenge twice per turn and reduces the mana cost to 1. Two random class cards a turn? That gives you something to dig for in case you don’t have any options. Note that when you use it, it only lets you dig for a spell that has already been played in the current game. If no spells have been played, you get stuff like A Small Rock, but getting Frostbolts in a game isn’t bad. The card selections you’ll receive range from Secret synergy to abilities that let you discover cards from your opponent’s class. If the option for removal spells like Assassinate or Deadly Shot show up, pick them up so you can Scavenge for them as needed. Unfortunately, if you’re like Matticus, you’ll get an option for 3 Putricides (I do not recommend that route). Hero Power: Fire! which fires your cannon(s). If they kill any minions, the power refreshes. Darius starts the game with an unkillable, unbuffable Cannon token. When using it, timing and positioning are key: if the Cannon is between two minions it will hit them both, and because killing a minion will refresh the power you want to aim for at least one kill with every strike. When you’re picking cards and treasures, there are a lot of options that synergize with your Hero Power. Dragonfire Ammo ups your cannon damage so you can keep the enemy board clear during the opening turns, and have a better chance to refresh the Hero Power. Seabreaker Goliath is a great finisher, and with as much as you fire your cannons, you’ll get him down to a reasonable mana cost. Tuskarr Raider gives you reach and the cannon fire is a nice bonus. Victorious Rally can also help with trades —and if paired with Entrenchment can give you a pretty powerful board. For cards, Commander (Inspire cards) and Attack (Rush and Charge cards) work well. Commander offers powerful synergy with your cannons, and you can get multiple Inspires per turn. Attack gives you spell-like reach with instant damage from Charge and Rush. Pick at least one Legend or Dragonfire pack, as you’ll need a couple of big minions for the later bosses. When playing, I aimed for board presence as soon as possible, with low cost minions like N’Zoth First Mate, Lowly Squire, Redband Wasp, or Amani Berserker. Your reach comes from the Rush and Charge minions, which can easily survive trades with the Entrenchment treasure. Then they can give you another trade next turn or simply hit your enemy — and if you can buff them with Mukla’s Champion, Abusive Sergeant, and Cruel Taskmaster all the better. 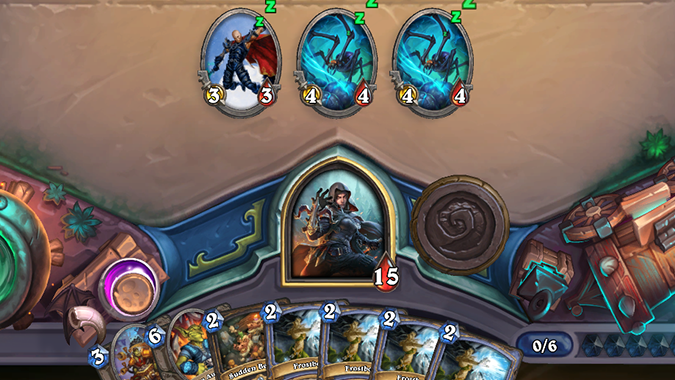 My strategy was to build a board, keep my opponent’s board as clean as possible, pick off enemy minions with canons, and then attack aggressively with Inspire-buffed minions. Hero Power: Dog Whistle, which summons a 1/1 Bloodhound with Rush. Once you get to Shaw, you’ll notice your opening deck starts with a mix of Hunter minions and spells. Use the Dog Whistle Hero Power to maintain board presence and control. Your Bloodhounds can help give you that extra reach to contest the board and clear the way for your main minions. The treasures you’ll receive will help augment your deck, just like in Kobolds. In Matticus’ first playthrough, he opted for the Lunar Signet to help get extra value out of Deathrattle cards. Entrenchment gives minions extra durability by giving them all +2 health, and that becomes incredibly useful with Dog Whistle because it means your bloodhounds can stick to the board. The card themes you’ll see range from Deathrattle synergy to Jungle Giants. There’s some merit to the Exotic Beasts as you can get cards like Ornery Direhorn or Chittering Tunneler. Sadly, Matticus ended up losing on the 5th boss though due to a lack of mass removal, so keep an eye out for cards that can help soften or clear the board for you. Hero Power: Temporal Loop, which starts your turn over. Toki is all about making smart use of her unusual Hero Power, which rewinds time to send you back to the beginning of your turn. It’s as though your turn never happened — and who can prove that it did? — anything you cast is back in your hand, their results undone. This comes in handy when you play anything that targets randomly, from Arcane Missiles to Firelands Portal. Don’t like the results of your spell? Just go back and try again — but be warned, you can only do this once per turn and sometimes the results of your second attempt will be even worse. But to make the most of it, you need a deck packed with with abilities that that pick random targets, draw/discover random cards, or summon random minions. Chaos abilities add to that randomness and make your deck entertainingly unpredictable. That’s not usually my favorite kind of gameplay, but I found it fun. Beyond going as random as possible with your spell selection, look out for the Double Time treasure, which causes the first spell you cast each turn to immediately cast a second time on a random target. This doubles the effectiveness of all of your spells, though you have to be wary of spells that can target you as well as your opponent (but that’s what rewinding time is for). And if it pops up, Potion of Vitality is practically a must-have for any dungeon runs: doubling your health lets you stay competitive against bosses that otherwise have more health than you. And that’s all for this rundown, folks. Now get monster hunting to take down Hagatha!